The RB 4000 pressure regulator is designed for industrial use: gas supply networks, district stations, industries, heating plants and all installations where accurate pressure control, ease of adjustment and fast response are required, such as for burners, industrial ovens and boilers. The RB4000 regulator is a direct-acting, spring-loaded regulator with an optional integrated safety shut off device. 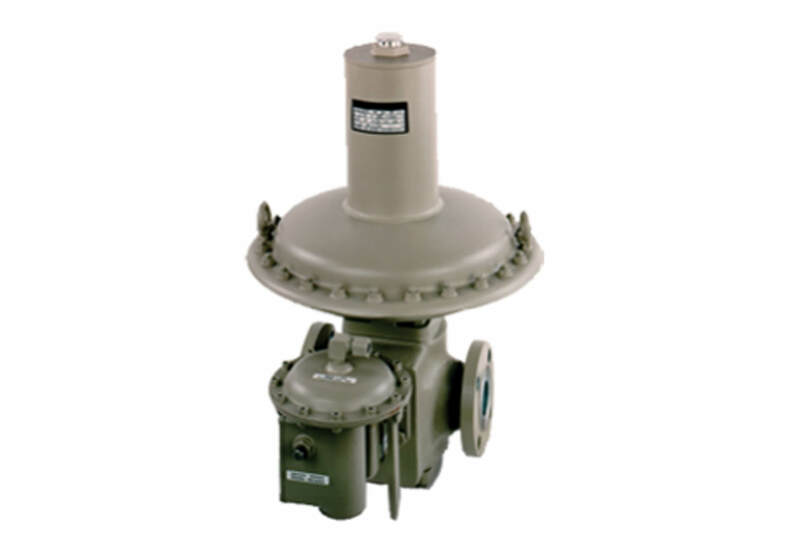 Its balanced valve design ensures constant outlet pressure when the upstream pressure varies. A built-in pulsation damper allows stable pressure control even at very low flowrates. An optional built-in shut-off valve offers protection against over-pressure or over-and-under-pressure. Its bypass system eases the shut-off valve relatching. The RB 4000 pressure regulator is designed for industrial applications, district station applications, and large appliance regulation where fast response is required. The balanced valve design provides constant outlet pressure under all inlet pressure conditions. The unique built-in pulsation dampener allows for almost infinite flow rate turn-down. All types are fitted with a mistake-proof SSV by-pass. A robust, efficient noise abatement cage can also be incorporated (optional).